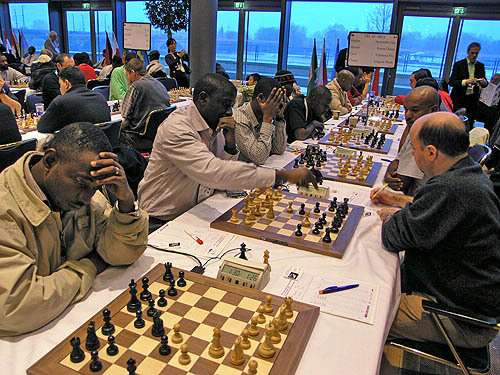 Back Row - Mr. Dirk Austin (Women Team Coach), Mrs. Beverley Howell-Mayers (Manager), Mr. Shamel Howell (UWI), International Master Jose Vilela De Acuna (Men Team Coach), FIDE Master Delisle Warner, Mr. Kelvin Daniel, Mr. Martyn Del Castilho (UWI, FIDE Master Dr. Philip, International Arbiter Rohan Waithe, Mr. Peter Dawson (BCF President) Front Row - Miss. Katrina Blackman (Coleridge & Parry), Mrs. Juanita Garnett, Miss. Corrine Howard (Barbados Community College), Miss. Rashida Corbin (National Woman Champion), Miss. 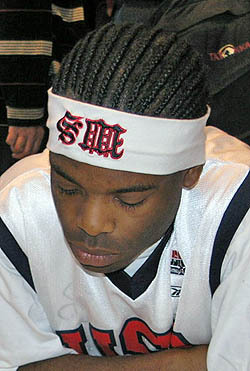 Cheri-Ann Parris (UWI). 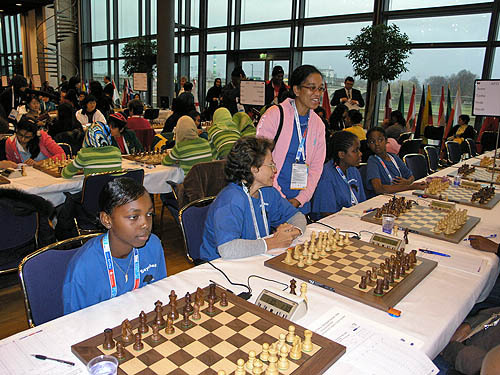 Photo by Barbados Chess Federation. 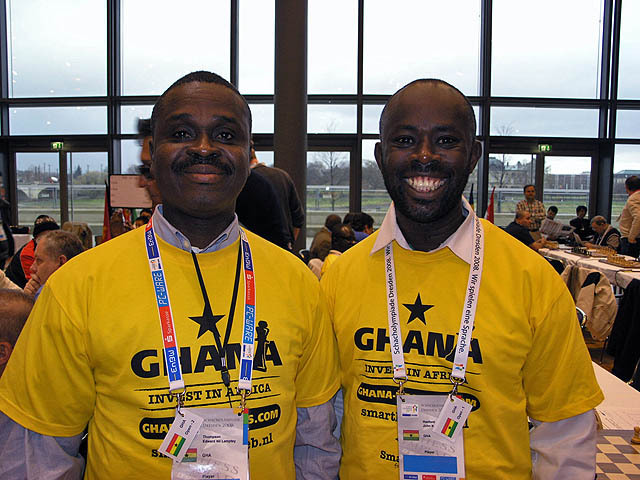 Uganda's Shadrack Kantinti (left). 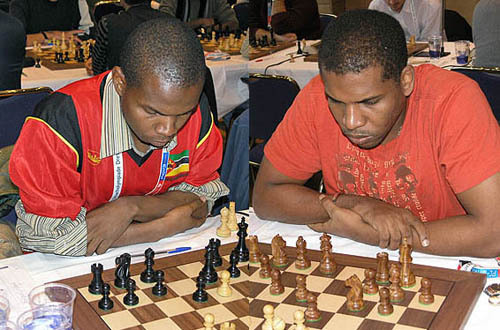 FM Steven Kawuma and his brother Moses battle against the British Virgin Islands (right). Steven plays Bill Hook while Moses plays Christopher Art. 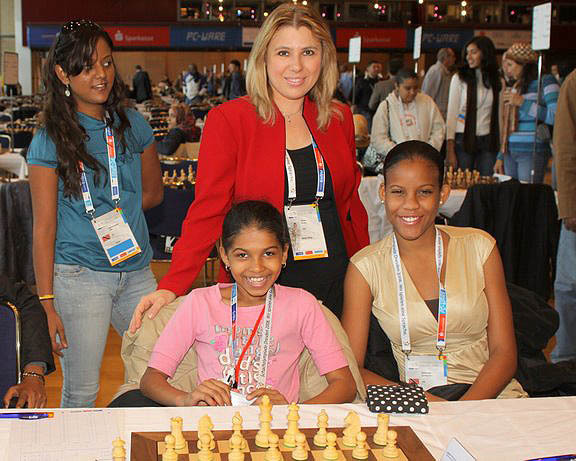 GM Susan Polgar posing with Trinidadian team. 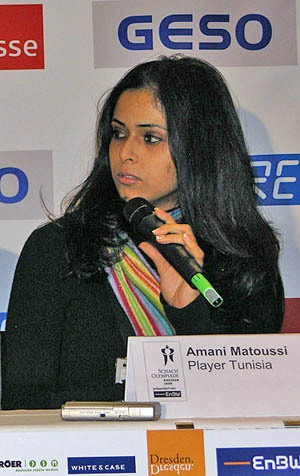 Standing left is Aditi Soondarsingh and seated are Javanna Smith and Lyndy Ann Guiseppi. Photo by FM Paul Truong. Jamaica playing Jordan: (right to left) Jamaica - Brandon Wilson, Duane Rowe, Shane Matthews, FM Warren Elliott. Photo by Ian Wilkinson. 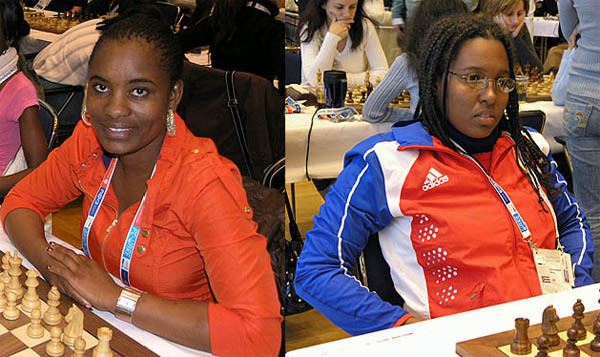 Seychelles women's team: (left to right) Shirley Anette, Bernadette Mein, Dericka Figaro and Marianna Eulentin. 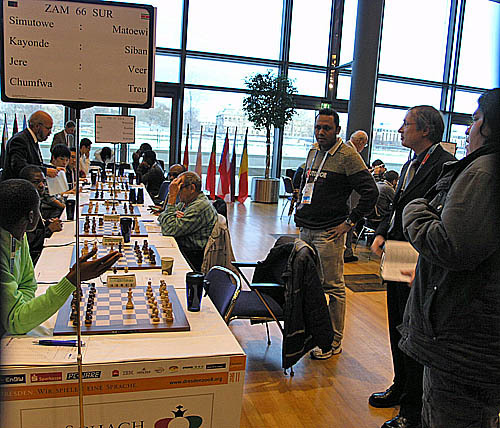 Amon Simutowe of Zambia (left) questioning the forfeit of Suriname's Roger Matoewi (far right) who was seconds late. 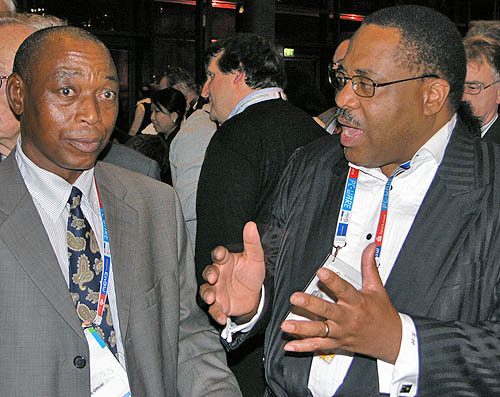 Simutowe wanted to play the game. The arbiter stood firm on the policy. 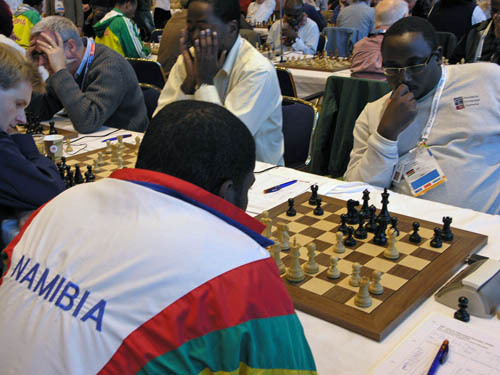 Controversy erupts in the Gabon vs. U.S. Virgin Islands match as Jean-Pierre Moulain (tan suit) protests the decision by arbiter. 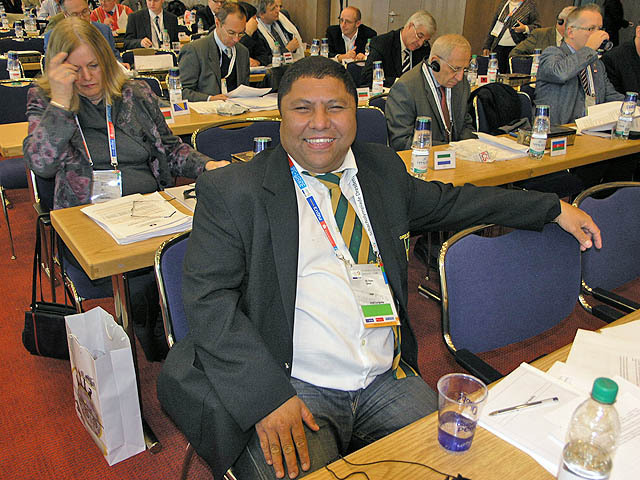 Michael Smith insisted on forfeit despite the fact he greeted Moulain at the board prior to round starting. Moulain was on 8.5/10 and Smith was on 0.5/10. 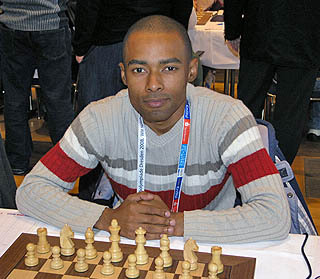 Photo courtesy of Barthelemy Ndjila. 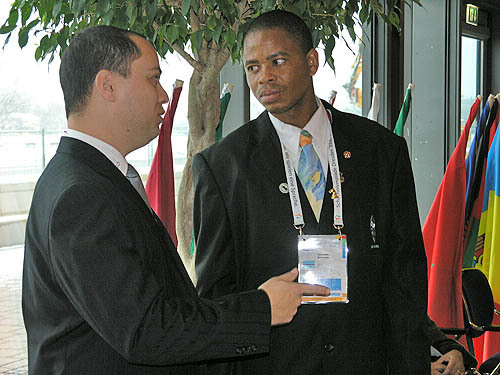 Boitumelo Keinyatse of Botswana speaking with one of the arbiters. 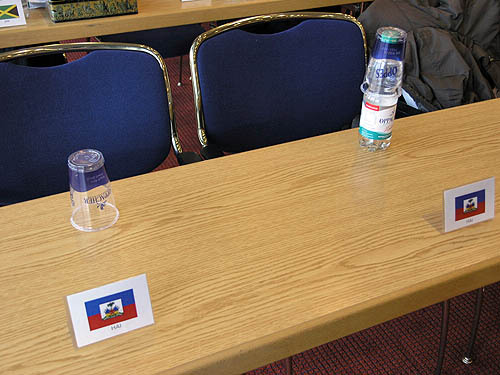 Haitian seat at FIDE Assembly. Send prayers for Haiti. 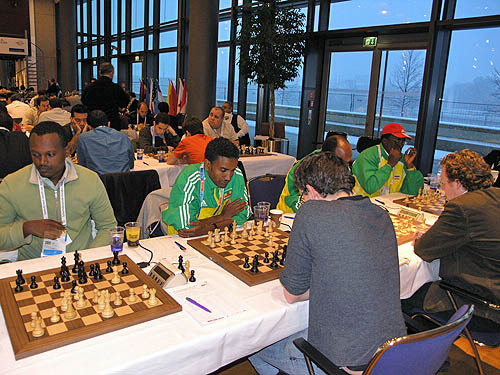 Nigeria vs. Netherlands Antilles. 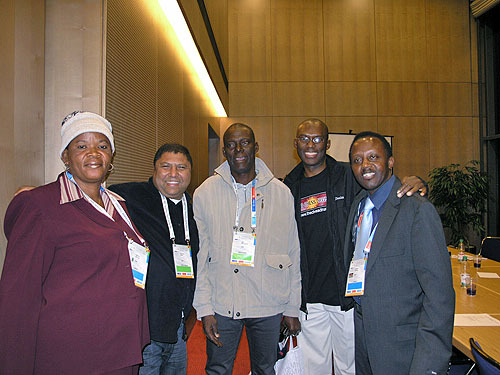 (L-R) Benjamin Omorere, Adebayo Adegboyega, Bomo Kigigha, Charles Campbell. 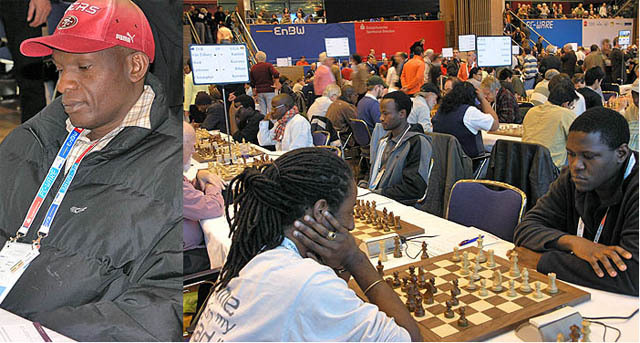 Adegboyega is facing Fabio Mensing and Kigigha is facing Sherman Maduro. There was a baby seen in a few photos. 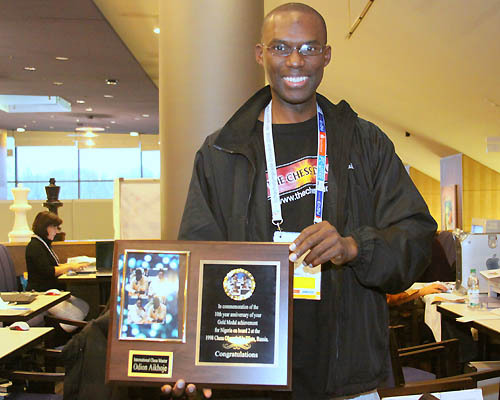 It was Israel Tolulope, the baby boy of Jeje Tolulope, board #4 for Nigeria women's team. 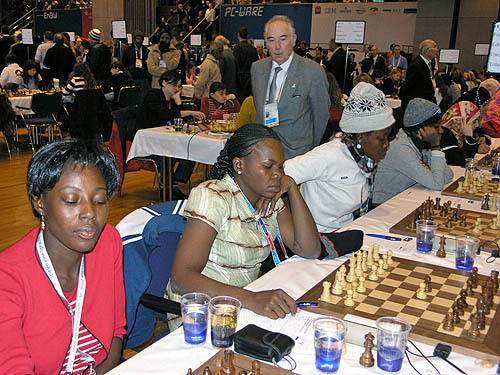 Israel accompanied his mother to the matches and was seen next to the board… quiet and content. 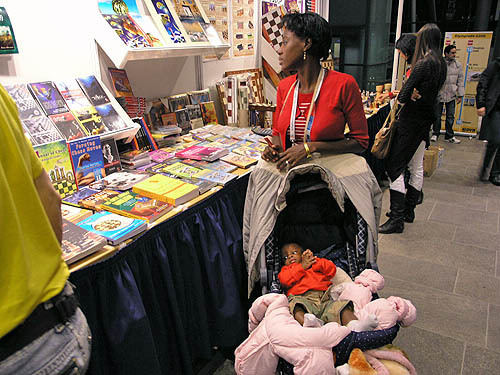 She is seen here browsing for books. Hopefully Israel will be coming to future Olympiads as a player! Costa Rica vs. Egypt (men). 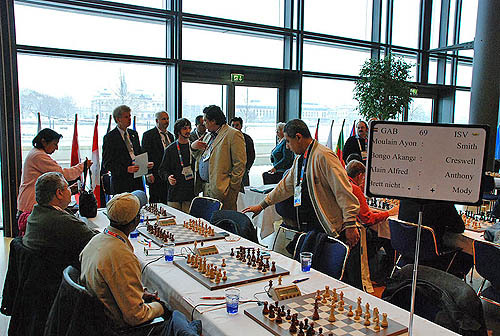 Egyptian GM Bassem Amin catches a glimpse of camera. 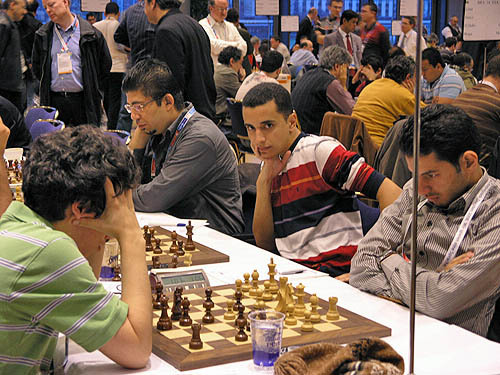 Also pictured are GM Ahmed Adly (right) playing GM Alejandro Ramirez and IM Ali Frhat. 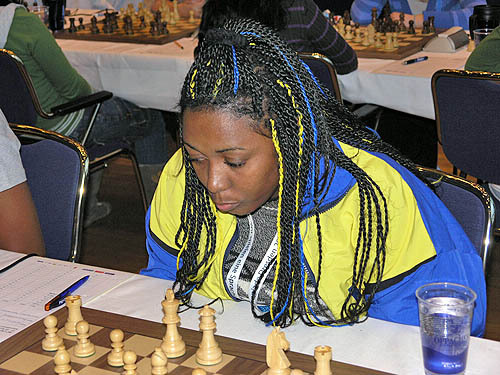 Barbados Juanita Garnett shows the "Bajan" spirit with the blue and gold braids. 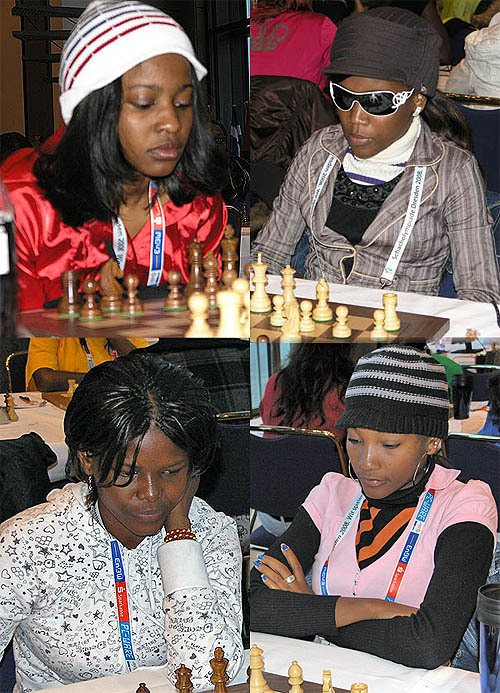 Angola women's team: (clockwise from left): Fatima Reis, Lucia Guimaraes, Valquiria Rocha, Sonia Rosalina. Not pictured Nelma Lopes. 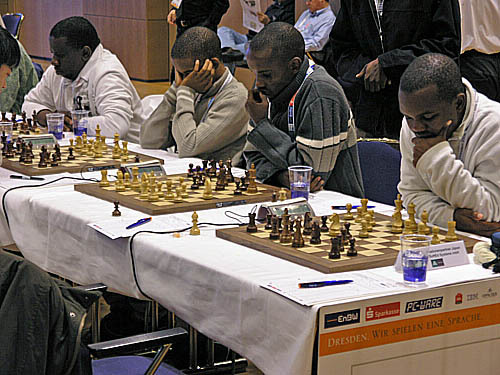 Botswana men's team: (right to left): Ignatius Njobvu, Pitlagano Tebogo, Barileng Gaealashwe, Chaza Bontsi. 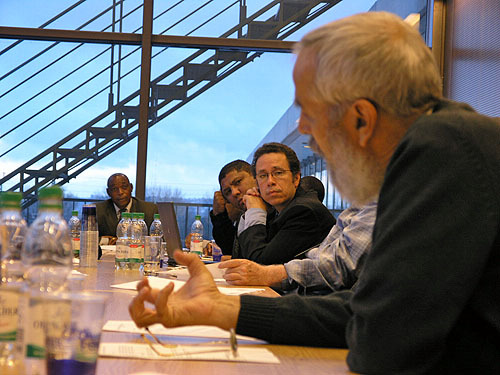 Botswana's Dabilani Buthali (chair), South Africa's Omar Esau and CACDEC Chair Allan Herbert listen intently to Algeria's Lakhdar Mazouz, member of FIDE's Verification Commission. 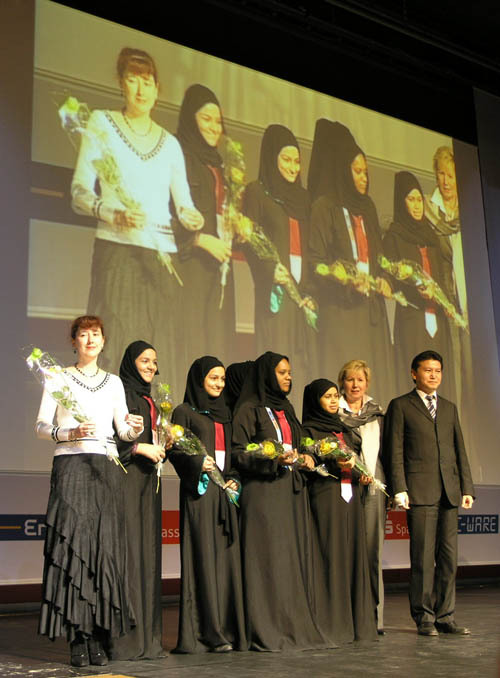 Qatar women win Category E prize! 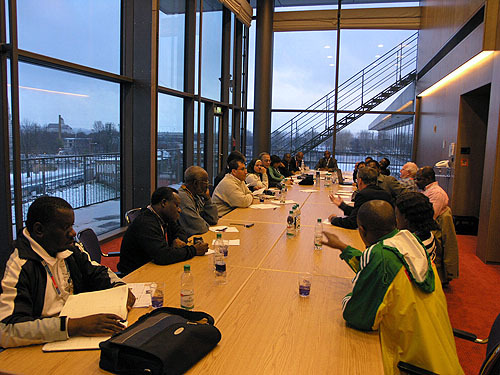 Qatar is located in the Gulf region of the Arabian peninsula and has a considerable population of African ancestry. 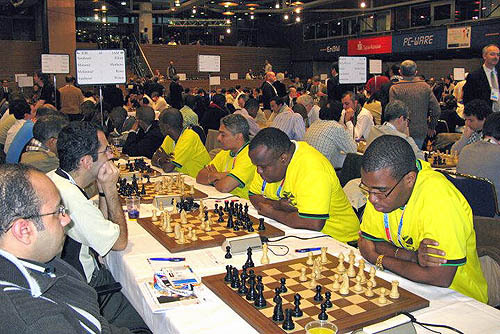 Seychelles vs.team members with IM Amon Simutowe in rear. 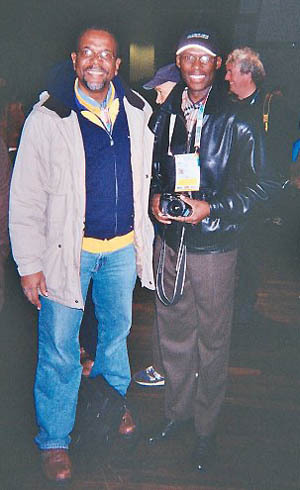 commemorating his gold medal from the 1998 Olympiad in Elista, Russia. Photo by FM Paul Truong.